I first met Lynne Boucher in 2014 at the Yoga Service Conference at Omega Institute. She had a flock of Nazareth College (Rochester, NY) students who were doing inspiring things both on campus and in the community. 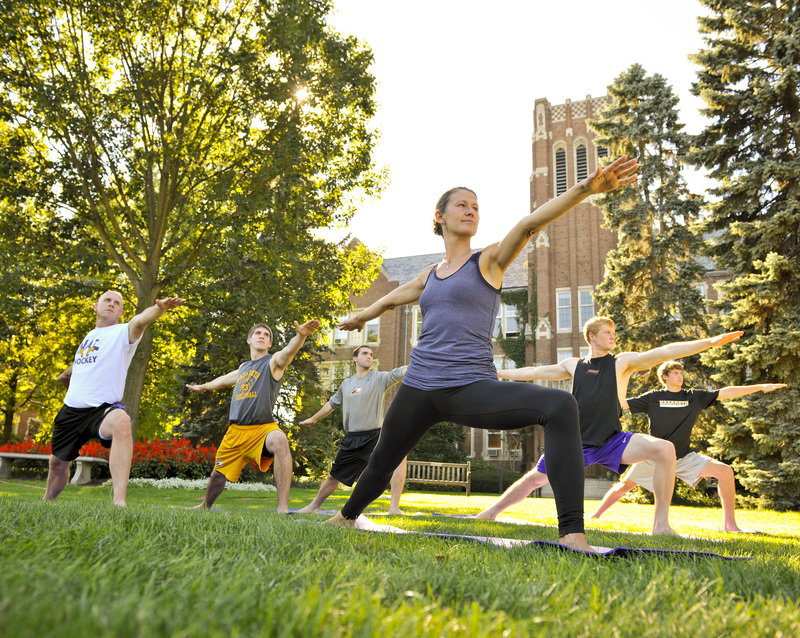 Lynne shepherds the award-winning "Yoga Revolution" on Nazareth's campus, coordinating the service of eight yoga teachers and dozens of student leaders in offering extensive yoga programs to hundreds of faculty, staff, students, and alumni in the campus community. Along with a team of justice-minded yoga teachers, Lynne founded the Rochester Yoga Service Network (RYSN) whose mission is to share the practice of yoga with underserved populations in the Rochester community. In a spirit of cooperation and community engagement, RYSN provides a supportive network for local yoga service providers, including training, reflection, and resourcing. Lynne's off-campus yoga service work is primarily with urban youth - particularly through two local organizations: Teen Empowerment and Young Women's College Prep. Once I experienced my own transformation through yoga in 2011, it was natural to share it with the students in my care as an interfaith chaplain and director of the Center for Spirituality at Nazareth College. My motivation to learn and teach yoga was deeply rooted in my desire to care for the college community's spiritual needs. While I initially focused on students, I've been increasingly motivated to help foster the "overflow" of yoga love from our campus family to those in need in our surrounding community. One of the most powerful experiences I've had with yoga service took place at the last session of a summer program in which several Nazareth students assisted in a daily yoga class for 7th grade inner-city girls from Young Women's College Prep. Our closing affirmation was followed by a gift for the girls: their own yoga mats, which made the girls shriek with delight. It was breathtaking to see our Nazareth students pass on the love they had themselves discovered. This scene continues to inspire me: sharing yoga love with a group of students on campus, so they in turn can share that love with others. During my years in higher education, I've learned about the mental health struggles of many college students. Statistics from Nazareth match national trends: over 20 percent of incoming students arrive on campus already medicated for various mental health issues. While this college population was familiar to me by the time I started teaching yoga, many off-campus populations we serve were not. Yoga Service Conferences have helped our yoga service leaders become more aware and sensitive to issues of cultural difference, power, inclusion, and trauma. In addition, RYSN offered trainings for yoga teachers led by mental health professionals with expertise in trauma and healing. I'm grateful that yoga programs at Nazareth are explicitly and unapologetically spiritual. We understand that yoga is a spiritual practice that helps individuals tune in to the sacred within themselves, their everyday lives, and the world at large. Yoga classes at Nazareth are coordinated through the Center for Spirituality, and include spiritual themes and meditations uncommon in more secular or gym-based yoga settings. As yoga teachers, we recognize our critical role in giving students tools to foster healthy habits and choices. However, we've had to acknowledge that our students' spiritual, emotional, and physical needs far exceed our capacity to serve them, and many students need additional support. To meet this challenge, we collaborate with other campus departments to provide complementary services, such as the Health and Counseling Center, Women's Health Club, athletics department, and PT clinic, among others. We listen to students who develop creative programming ideas, such as an annual yoga retreat, and specialized yoga workshops. Anyone working with college students should assume that a majority of them are dealing with extraordinary amounts of stress, anxiety, depression, and angst. On a positive note, national studies reveal that these emerging adults are eager to explore their spiritual life in non-traditional and unconventional ways. Yoga has attracted students from "all faiths and none," who want to explore the connections between mind, body, and spirit. During a time when people feel increasingly disconnected from themselves, their bodies, their spirits, each other, and the earth itself, the yoga service movement can be a spiritual revolution! At the national level, the Yoga Service Conference will continue to foster awareness, and regional networks will begin to form in the coming decade. I hope that college campuses - always hotbeds for spiritual growth and community engagement - will join Nazareth in guiding the next generation of yogis to foster a lifelong commitment to their own spiritual development, and that of others.